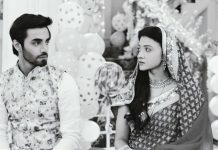 Anika asks Shivay how to he marry any random girl. Shivay explains that he was marrying Richa to save the family, business and respect. Anika asks what about Richa, when did he start buying people while buying companies. Shivay gets hurt hearing this and recalls Daksh’s words. He confronts her for selling herself to Daksh. Anika does not understand. He gives her no right to interfere in his matter and remarks on her one night stand with Daksh. Anika gets a big shock and slaps Shivay angrily. She calls him a cheapster by mind. She does not give him any explanation. Shivay hurts Anika angrily and forces her to marry him. He orders her to sit in mandap in Tia’s place and become his wife. Anika refuses to marry him. Shivay forces her to fulfill all the marriage rituals and put sindoor of his name. He tells his decision to give her divorce the next day. Anika does not listen to him. Shivay does not give her any option and throws her away to get ready soon. He asks her not to test his patience, and threatens her for marriage by kidnapping Sahil. Anika fears Sahil’s death and agrees to marry Shivay. Shivay fills sindoor in Anika’s hairline, while her face is covered in ghunghat. He makes her wear the mangalsutra, while hiding her face from everyone. The family does not know whom is Shivay marrying. They all are glad that Shivay is marrying Tia. Anika cries and stops at every step. Shivay holds her hand and makes her put garland in his neck. Shivay holds her hand and takes the wedding rounds, against her will. Anika could not stop him. Shivay was marrying Tia, and changed mind in the last moment. Anika has become Shivay’s wife and is unhappy. They both are not confessing what they feel for each other. Shivay and Anika get married by all the rituals, and take elder’s blessing. Dadi asks Shivay why does he look upset after his marriage. Shivay has maintained a long silence, while Anika is in shock by Shivay’s step. Anika does not know to be happy or sad by the marriage. When it’s revealed that the bride is actually Anika, there comes a big shocking moment for the family members. Shivay and Anika’s grah pravesh is next thing after their dramatic marriage. 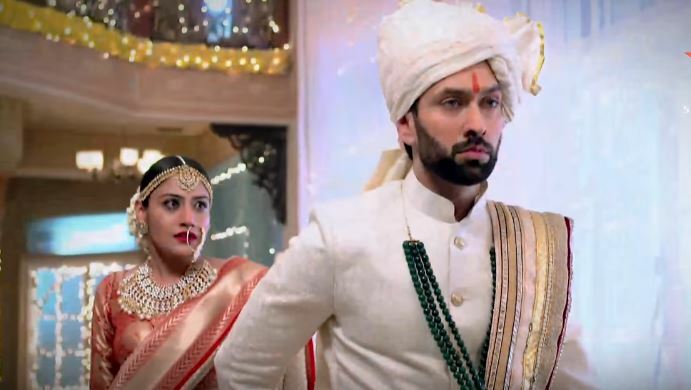 Anika has done a big favor on Shivay by marrying him in such times when his bride has run away. 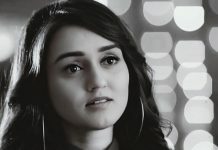 At the grah pravesh, Anika does not go ahead. Shivay holds her hand and takes her ahead for the grah pravesh. The grand grah pravesh turns shocking when Dadi lifts the bride’s ghunghat. The family gets a shock seeing Anika. Pinky gets angry and asks Anika where is Tia, why did she sit in Tia’s place. Pinky did not wish anyone else to become her bahu than Tia. Anika’s mu dikhai will be more dramatic, as Anika and Shivay’s marriage will be known to the world.